Rated #1 on Trip advisor in Jaco Beach, Cr. Luxury 3 Bedroom 2 Bath Condominium for sale in Monaco. The spacious living area consists of three bedrooms and two baths. These condos have modern furnishings and are beautifully decorated. There are patios from the living room and one off of most bedrooms. Fully furnished gourmet kitchen to cook up your catch of the day! You will find granite throughout the condo. The two bathrooms have tile walk in showers. For your convenience, a laundry unit is located in the condo. Located in the heart of Jaco, this condo is easy walking distance to the beach, the famous Jaco night life, restaurants, shops, beach bars, grocery stores, liquor stores, pharmacies, and much more. The beautifully landscaped Monaco Condominiums are centrally located and guarded 24/7. The kitchen is stocked with dishware, silverware and includes a stove top, beautiful granite, oven, microwave and refrigerator. 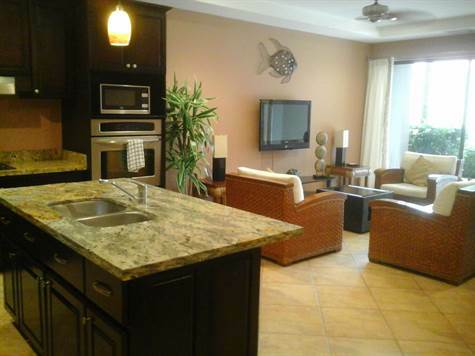 Cook your own tropical cuisine in this beautiful, gourmet kitchen. The Monaco is beautifully landscaped with hundreds of trees and tropical plants native to Costa Rica while the rooms offer luxurious, modern accommodations. There are (18) Luxury Condos, (6) Junior Penthouses and (1) Deluxe Penthouse. The property is well-equipped offering two swimming pools, a hot tub, a barbeque area, two elevators and rental office. The Monaco also offers a concierge service for guests. Please contact the office for more information. The property is gated and secured 24 hours a day by security cameras, motion sensors, and a security guard. Monaco Condominiums are located in the center of Downtown Jaco Beach, within walking distance to shops, restaurants, the beach and Jaco’s infamous nightlife attractions. Increible condominio de lujo, localizado a tan solo 100m de la playa, a pocos metros de la calle principal de Jacó, la cual concentra la mayoría de restaurantes, tiendas, bancos y supermercados, en el cantón de Garabito conocido por sus atractivos turísticos y naturales. Este lujoso condominio cuenta con 3 habitaciones y 2 baños, zona de lavandería y cocina con sobres de granito, lavadora automática, estufa plana y horno, refrigerador de dos puertas y horno de microondas. La sala y una de las habitaciones tienen salida a la terraza que incluye un hermoso jardín. El condominio está finamente amueblado y decorado con todos los implementos necesarios para una cómoda y agradable estadía. El complejo de condominios cuenta con 18 condominios Luxury, 6 Junior Penthouses, y un Penthouse Deluxe. Incluye también 2 piscinas, zona compartida con parrilla, dos elevadores, oficina de rentas vacacionales. Además parqueo, seguridad 24 horas, con cámaras, y hermosos pasillos con jardines que trazan la ruta a los condominios. Para mayor información o para una visita al condominio no dude en contactar al agente representante.